What if you knew everything there was to know? What if the true answer to any question was ready in your mind the moment you asked for it? What if the answers always came every time, and were never wrong? What questions would you ask? What would you do with the answers? And who would you trust? Sara Starbright has exactly that problem. Being eleven is hard enough, but not having anyone to confide in is even harder. What's the point in getting to know someone if you already know everything about them? Sure, Sara's single mom tries her best to understand her daughter, but making ends meet is about all she seems to have time for these days. And Sara has bigger problems on the way too, problems that even she can't see coming, for having all the answers is nice, but asking the right questions is the real talent. Sara Starbright has the most important gift the universe has ever given, and all manner of creatures from all realms of the imagination want to take it for themselves. What can one small girl do to protect herself from the deadliest and most impressive force creation has ever amassed? Yet in her darkest hour, Sara may have just met the one person in the entire universe capable of being her friend. 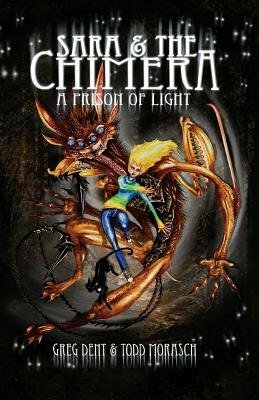 Stifled and stunted in the deepest inner chambers of the Fishman's worldship prison colony, a boy named Jonathan Wheeler lies in a state of suspended animation. Through an unlikely twist of fate, he has found himself in the body of an ever-growing and ever-changing monster, the Chimera. With boundless energy and strength at his command, all he needs is the right bit of knowledge to get himself out of his cell and to freedom. As they escape from one world to the next, Sara and Jonathan find that together they make a pretty good team. But when you can't trust anyone, and when the universe turns out to be quite a bit bigger than you could have ever imagined, who can you count on to guide you towards somewhere you actually want to be? Meow. Imprint: Epidemic Books Company Ltd.